Making your bike fit you – We will install your bike on a trainer, and while you are riding it, we will take various measurements. This allows us to see you in your natural riding position. If possible we will make adjustments to your current equipment, or we may make suggestions for swapping out various parts to achieve the best fit. 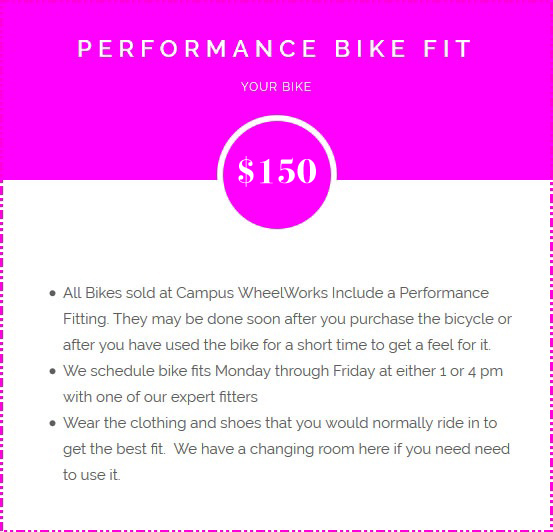 Buying a new Bike – Everyone purchasing a bike at Campus get's sized for a new bike for free. If you don't get the right size bike you are starting out on the wrong foot and you will not enjoy the ride. Some riders can benefit from an additional bike fitting before purchasing the bike however, if they are looking for a new bike and can’t seem to find one that’s the right size. 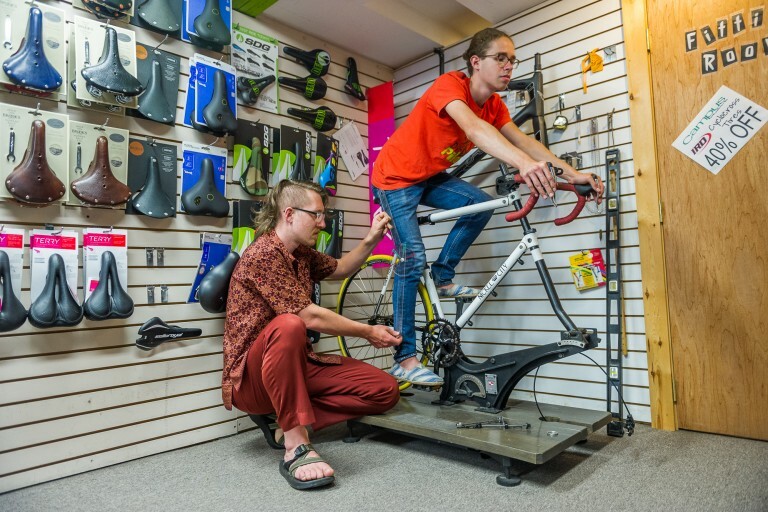 Having a bike fit may be the answer to your problems. We are able to determine the best fitting bike for you by gathering information about your size and comparing it versus different frame geometries. If you buy a bike here, the fit is free. A Common misconception is that bike fitting is just for high performance road athletes. While it is true that performance fitting is something that will drastically help comfort and even performance on a road bike, we have fit just as many casual riders on their bikes to help them address their discomfort. You won't want to ride your bike if it uncomfortable, that goes for the highly trained tri-athalete as well as the person casual riding around Delaware Park for exercise.